Campers and volunteers enjoy crafts under a tent Wednesday afternoon during KAMP Dovetail at the Rocky Fork State Park campground. 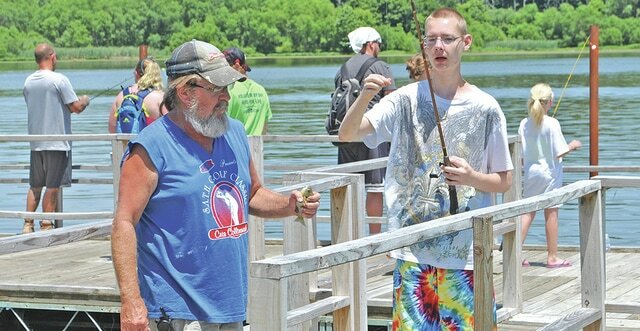 Jakob Duffey receives help from a volunteer after catching a fish Wednesday at KAMP Dovetail. As day three of KAMP Dovetail moved into the afternoon hours Wednesday and preparations for day four were already under way, campers and volunteers frolicked around director Linda Allen’s golf cart under sunny skies. Allen said it’s like a miracle how things fall together each year to create a special week for a few hundred special kids. For instance, she said, it rained all last week and there were forecasts for rain most of this week. There was a contingency plan for KAMP to use Hillsboro Elementary, but the rain has stayed away. KAMP (Kids And Motivated People) Dovetail, now in its 34th year, is a volunteer-run summer camp at Rocky Fork State Park sponsored by Supplementary Assistance to The Handicapped (SATH), a local non-profit organization. The camp is for children with disabilities in Highland and surrounding counties. There are 285 campers this year. There are 417 volunteers, all trained to work with the campers one-on-one, and another 300 volunteers who come and go throughout the week, serving meals and performing other tasks. Many campers show up year after year, so a new theme gives them a new camp to look forward to. This year’s theme is “Around the World in Five Days.” Campers are split into 10 different groups, each one named for a different country. Each camper received a “passport” at the beginning of KAMP and each time they visit a different “country” they receive a sticker for their passport. The campers were taught how to say hello and goodbye in their country’s language and on Tuesday night they sampled cuisine from different countries. The campers are offered a plethora of activities daily like boating, fishing, horseback riding, swimming, crafts and all sorts of games. Each day also has special activities. Wednesday afternoon they were offered horse-drawn wagon rides, and in the evening there was a carnival, plus an auction that annually raises anywhere from $5,000 to $10,000 for KAMP. Thursday morning they’ll see a movie at Star Cinemas in Hillsboro where they’ll get free popcorn and soft drinks. In the afternoon they’ll pack a sack lunch and take a hike, and in the evening – the last night before they check out Friday afternoon – they’ll have a hog roast and dance. Allen said it’s priceless to watch as campers dance with the volunteers. “The kids get pretty emotional. They’re all dressed up and they’ll do a dance they learned from their country through the week,” Allen said. Tuesday evening, as a pink sunset rose in the sky, campers watched a hot air balloon inflate and fire-up. In the weeks leading up to KAMP, Allen spoke to both the Greenfield and Hillsboro Rotary Clubs and mentioned she’d like the kids to see a hot air ballon as part of the week’s theme – like a way to travel around the world. She called all over trying to find one, but the cheapest one she found was $2,000. That was too much for KAMP’s budget. Then she heard that local resident Bill Bear had persuaded a balloon owner to attend a local event not long ago. She called Bear, Bear called Charles Mays in Williamsburg, and Mays said he would be privileged to bring his hot air balloon to KAMP – for free. Shortly thereafter Allen got a call from a Greenfield Rotary Club member. The member said he wanted to make the hot air balloon appearance a reality and wanted to cover the $2,000. When Allen told the Rotarian she already had a balloon for free, the Rotarian said they wanted to donate the $2,000 to KAMP anyway. On Friday, the kids will enjoy all their regular activities, then there will be an awards ceremony before they check out. Every camper will receive an award. The volunteers stay on another day to clean up on Saturday. “It’s been a good week,” Allen said.